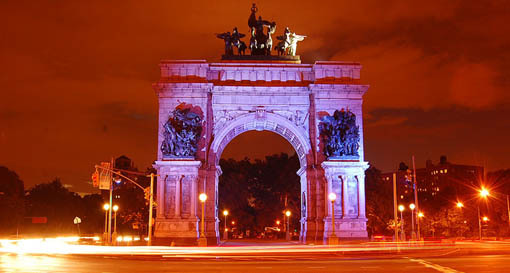 Reinventing Grand Army Plaza: What Are Your Ideas? The Grand Army Plaza Coalition (GAPCo) and the Design Trust for Public Space are launching an "Ideas Competition" called Reinventing Grand Army Plaza. Building on GAPCo’s on-going effort to re-envision this historic Brooklyn crossroads, the Ideas Competition will solicit new, creative proposals for Grand Army Plaza’s re-design. Top submissions will be exhibited in the summer of 2008 at the Brooklyn Public Library or the Brooklyn Museum of Art. To document GAPCo’s progress to date, the existing context of the Plaza and the competition’s goals and aspirations, GAPCo is creating a Briefing Booklet for competition entrants and they want your thoughts, ideas, hopes, frustrations and visions for Grand Army Plaza represented in this publication. The briefing booklet will quote from responses to this questionnaire. Please answer the following questions by December 20, 2007. What about Grand Army Plaza currently functions well? What existing problems could be addressed by a Plaza re-design? What potential uses or opportunities for the Plaza might a Plaza re-design incorporate? Please include your name, organization/affiliation, neighborhood and contact information in your response. For more information about this project, please visit: http://www.reinventingGAP.org. Email info@reinventingGAP.org with questions or to be placed on the competition mailing list. Someone who is not a traffic engineer please reinvent me! This sounds like a really fun way to participate in planning for Grand Army Plaza. Crossing the street there can be a pretty stressful undertaking, not to mention trying to navigate the circle in a car! It is nice to see this organization reaching out to the community. I also wanted to mention the Campaign for Community-Based Planning’s new blog: http://www.communitybasedplanningnyc.org… I’ll be adding this information, and there’s lots more about ways to get involved with shaping planning in New York City. What about thinking of a redesign that works for ALL the traffic circles in NYC where pedestrians and cyclists are seriously endangered? You can probably think of more…and a few traffic squares too. is it still possible to go up inside the arch and on top? if not, they should open that back up again, with a guide of course. The plan outlined by the Coalition is so radical, but at the same time so good. It does seem likely to create a bottleneck for Flatbush Avenue traffic, if I’ve interpreted it correctly as having a narrower traffic corridor. One thing I’m wondering: should the new greenspace be re-graded, so as to produce a level area at what is now the park entrance, or allowed to remain as it is now, and grade uphill toward the park? I like the setup that Gapco proposed earlier this year (and you guys posted again recently). This intersection is a disaster for pedestrians, and it is a real challenge for motorists as well. We have a car, and the first time I had to navigate this wreck I was utterly confused. Flatbush Ave is two lanes in each direction on either side of GAP, right? So you just need to keep those two lanes in each direction and it’s not a bottleneck at all. Any discussion of enlivening GAP as a place should include cutting gaps (no pun intended) in the planted berms to create better porosity with surrounding neighborhoods and remove the long dead stretch in the middle of the circle. What is Your Idea for Grand Army Plaza?